The Sioutas Personal Cascade Impactor separates and collects airborne particles in five size ranges. When used with PTFE filters the Sioutas Impactor is highly efficient at collecting particles without the use of impaction grease or substrate coatings, and at retaining unstable compounds for size-fractionated chemical analysis. It is the only personal impactor that efficiently samples coarse, fine and ultrafine particles simultaneously. Particles above each cut-point are collected on 25 mm filter in the appropriate stage with particles below 0.25 µm collecting on the 37 mm after-filter (optional). Use the Sioutas Impactor with the Leland Legacy sample pump at 9 L/min to ensure precise particle separation at the specified cut-points. * Requires special provisions, please see the Sioutas Cascade Impactor Instructions. The Sioutas Impactor uses four 25 mm filters (required) and one 37 mm filter (optional). The 25 mm PTFE filters act as a collection substrate and the optional 37 mm PTFE filter is the final collection filter (After-filter). 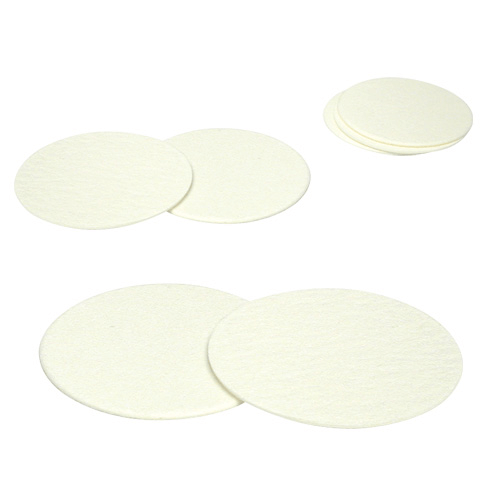 We recommend PTFE filters to minimise particle bounce and to preserve unstable compounds. Coated collection substrate may be used if desired. However, a coating is not necessary and can interfere with chemical analysis. † The maximum operating temperature for PTFE filters with PMP support ring is 240°C (464°F).